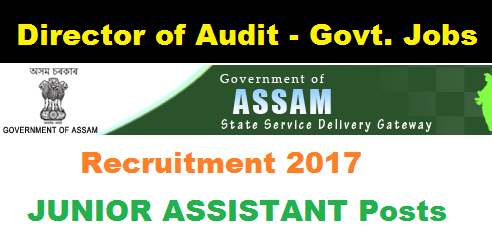 Director of Audit Local Fund Assam Recruitment 2017 notification is out for filling up 22 Junior Assistant Posts. Application are invited from intending and eligible candidates, who are citizens of India and having registration no. in employment exchange in the state of Assam as defined in the Articles 5 to 8 of the constitution of India in the prescribed Standard Form of Application as given in Part-IX of the Assam Gazette, for filling up the following vacancies under the Directorate of Audit (Local Fund), Assam, Guwahati -6. Following are the details of Director of Audit Local Fund Assam Recruitment 2017 with number of vacanices, post details ,Age limit , Educational Qualification , Payband etc. (a)Candidates must Passed Degree Examination in any discipline from Govt. recognized University as required by Govt. (b) Desirable – The candidates must possess a minimum 6(six) months Diploma/ Certificate in Computer proficiency from a recognized institute. Age limit: Candidate must not be less than 18 years and more than 43 years as on 1st January 2017. The upper age limit is relaxable by 5 years for SC/ST candidates. In case of Ex-servicemen, the age limit is relaxable by 2 years Relaxation of age as per existing rules. Interested and eligible applicants have to submit their application along with photocopies of all testimonials duly attested regarding qualification, age, caste, employment exchange registration card, Caste certificate (in case of reserved category candidates), Disability Certificate (in case of Person with Disabilities) issued by competent authority, Original Treasury Challan, copy of BPL certificate in case of candidates of BPL families and two recent passport size photograph of the candidate with his /her signature at the top. The self addressed envelope of 10’x4.5′ affixing postal stamp of Rs.5/- must be enclosed with the application. Note : Applications should reach the Directorate of Audit (Local Fund), Assam, Guwahati -6 on or before 06.11.2017. Any application received after the date as well as any incomplete application shall not be entertained. Government servants should apply through proper channel. Candidates should clearly mention the post applied for in bold letter on top of the envelope containing the application. Following are the application fee structure. a. For General candidates= Rs. 250/-(Rupees Two Hundred Fifty) Only. b. For SC/ST/OBC candidates= Rs. 150/-(Rupees One Hundred Fifty) Only. c. Candidates having BPL certificate= NIL. Fees should be deposited only through Treasury Challan in the Head of Account “0070- Other Administrative Services- 60-other services-800-other receipts”. Next Atal Amrit Abhiyan Vacancy 2017 – Latest Recruitment in Assam Govt. The attestation is self attested or gazzeted officer will be attest it? As in the official advertisement there is no mention whether the attestation needed to be as self attested or gazetted officer attested . Hence as our point of view you can use either self attestation or gazetted officer attestation.